There are moments in live when we have to pause for a while. Moments of connection and happiness that we should not take for granted and move on to the next task. 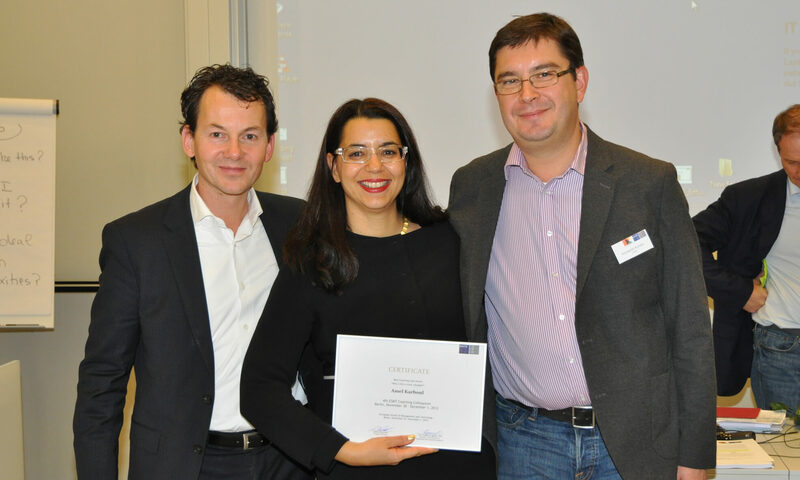 I am extremely proud, happy and humble to have received today the 2012 Best Coaching Colloquium Case AWARD in Berlin during the ESMT/KDVI Coaching Colloquium. Konstantin Korotov and Andreas Bernhard (ESMT) chose the case based on the case’s originality, learning and developmental impact on the coaching community, and the ability to demonstrate self-reflection on the part of the author. Susan David (Institute of coaching at Harvard) has in a professional and supporting way facilitated quite an emotional session. I was fortunate to share with the distinguished audience an incredible experience of coaching a CEO and his team during a major transformation. This team coaching was not only a transformation for the client but for me too and it was a journey about meaning making in a world of differences. Overcoming the “us versus them” and creating human connection among the team members as well as reminding them of why they work, what contribution they are making for the organization and for the community were critical success factors. It did cost me a lot of courage to stand up to put the “elephant” on the table. My colleague and I decided not to play any games, to be authentic and clear in an appreciative and supportive manner. I can tell you that for a top team that rather deny their own dysfunctions and by that threatening a multi billion € investment, to open up and look in the mirror was a huge step. It was not about “feeling” better but about creating a high performing top team that can navigate the company in times of crisis. It was about overcoming egos and creating space for different perspectives and truths. Together with the team we achieved a tipping point! If you are interested to read the case in a confidential preliminary version, please contact me via the comment function of this blog.